A spectacular new species takes hold in Maine. We kid, we kid. All jokes aside, there’s a new potato in town taking parts of Maine by storm. It’s called the Caribou Russet, a new variety of potato produced through the University of Maine’s breeding program. Now, after a long journey to the top of the heap, it’s exceeding expectations on its first release into the market. 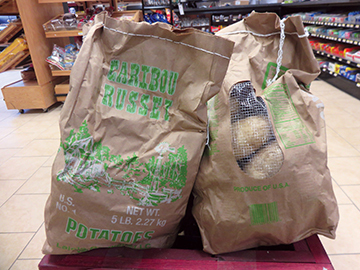 “We’re very happy campers,” said Don Flannery, the executive director of Maine’s Potato Board. “All potatoes have something that isn’t ideal, and certain characteristics everybody wants.” Those involved in the potato business are constantly seeking the perfect potato, he said—one that stands up to all kinds of cooking, grows well, is resistant to disease, and is consistently, aesthetically appealing. The UMaine breeding program begins with upwards of 200,000 potato crosses. Over the course of seven to nine years, the numbers are whittled down to a few promising varieties. Those are sent to breeding programs around the country to see how they grow in different regions. Two or three finalists are chosen, from which investigators build up a seed supply and start growing trials in small, two- to three-foot plots. Finally, one variety is chosen for planting in 10- to 15-acre commercial trials. Now in its first retail run, you can find it at Tradewinds Markets in Blue Hill, Ellsworth, Clinton, Milo, Calais, Brewer, Eddington, Norridgewock, and Veazie; Whitney’s Family Supermarket in Corinth; and Danforth’s Down Home Supermarket in Hermon. Look for the five-pound brown paper bags with a vent on one side and bold, green lettering on the other that says CARIBOU RUSSET. According to Flannery, you’ll begin to see them in larger supermarkets next fall.